I went to a local spa and was looking for a great nighttime moisturizer to help prevent wrinkles in the future. I am a firm believer that you have to start prevention early on, heck my moms been making me use under eye cream since I was 18 because she says it runs in our family that we have crow’s feet early on, fun fun right?! So I go to a local spa and the lady there tells me about a line called Phytomer which its slogan is ocean, science and beauty. The lady told me they had a specific line that was made for women in their 20’s fighting the beginning stages of wrinkles. I was very intrigued since most skin lines are not for women at this age. 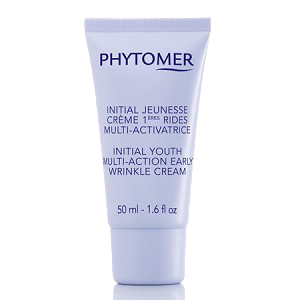 I purchased the Initial Youth Multi-Action early wrinkle cream which their site says improves cellular renewal, stimulates collagen synthesis and reinforces antioxidant protection. The product has a lovely spa-like scent and is a creamy consistency. I used this product for a good month straight at night and I felt like that this product was too heavy for my normal-oily skin. Additionally, I noticed that my skin seemed a bit more congested. This product may be better for someone that has drier skin. My overall skin tone seemed to remain the same as it had when I started the product with no real noticeable results. I stopped using this on my face and instead use it on my neck which it moisturizes well with no problems. Bottom Line: This product just did not work for my skin. A bit too heavy but works fine on my neck.